That’s high praise indeed, and a response I would have neither understood nor believed before seeing “Tapestry in the Renaissance: Art and Magnificence,” which is now at the Metropolitan Museum of Art. Tapestries, to me, had always been dim and dowdy things ravaged by time that no one but an academic drudge could like. At best, they were merely charming. At worst, they were clotted, overstuffed, and stale, like the Christmas fruitcakes that people admire but do not eat. But this exhibition, which has been organized by Thomas Campbell and includes 41 tapestries and about twenty preparatory drawings and designs, opened a new world for me. It has opened other eyes as well; there’s a growing museum murmur about this show. Which means there are now two especially rich, visually challenging exhibitions engaging New Yorkers: Gerhard Richter’s weaving of modernist styles at moma and the painterly tapestries at the Met. The central story of Renaissance tapestry is its fruitful combination of Italian ideas with Netherlandish art and craftsmanship. In the sixteenth century, Raphael’s designs helped bring fresh ideas about perspective, dramatic concentration, and painterly effects into the workshops of the north. The skill of the weavers in translating such designs into thread was staggering; the show is, among other things, a howdunit. 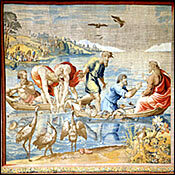 In The Miraculous Draft of Fishes – one of three Raphael-designed works in the show – the weavers even captured the reflections in the water as the fishermen hauled up their intricate nets. And the ability of these craftsmen to weave character into a face rivalled that of a quick painter with a deft brush. Northern artists, too, were inspired by Italy, designing tapestries that were sent to courts throughout Europe; weavers also found work in France and Italy. The cost of creating these sumptuous works, rich in silks and gold thread, was enormous; the “Acts” was much more expensive than Michelangelo’s ceiling fresco. As a result, tapestries became one of the great symbols of princely power in the Renaissance. Without them, a palace looked naked. The usual problems of exhibiting Renaissance art – museums can borrow small paintings, but not frescoes, large sculpture, or buildings – often lead to a misunderstanding of Renaissance scale. These enormous tapestries help restore the grandeur of the period’s dreams. In the catalogue, scholars have understandably emphasized the role of the tapestries as a reflection of political power and presented much basic research; so few tapestries survive that this eminent art form has to date attracted little attention. But I was more interested in the imaginative character of the art. Though somewhat faded by time, many tapestries on display remain remarkably fresh, and their shimmering light is magical. The rippling texture of the weave, for example, gives a gentle tremolo to the reflections from the gold thread. The combination of tiny, needle-fine details and a larger view or panorama creates an unusual sense of fullness and completion. The tapestries appear steeped in time, not only because we are conscious of how long they took to make but because our own sense of time has something in common with loom and thread; our memories are woven through our minds. Above all, these works do something remarkable to boundaries. Their muffled closeness draws in the space of a room, creating a sense of intimacy. At the same time, they dissolve walls, creating a glowing and populous world beyond the usual constraints. There is no limit placed upon the purview of a prince – or upon the power of an imagination.